Here is how to test your own craniofacial height / standing height ratio. Take a picture of yourself facing the camera, looking forward. A good rule of thumb is for the bottom of your eye socket to align with your earhole; you can use a side mirror to practice your posture before you take the shot. Obviously, you shouldn't wear shoes, and you should arrange your hair in a way that it doesn't "stand up". Your mouth shouldn't be open or your jaw loose; just have a natural expression. Also, make sure that the camera is a few meters away from you; the more, the better (as long as you can produce a picture with enough resolution for measurement). Use a self-timer or have your friend take the picture. craniofacial height CFH: from top of your head to bottom of your chin. standing height SH: from top of your head to the point on the floor where your heels touch. Now divide CFH/SH and you have your own ratio: congrats! You can take SH/CFH to see how this is expressed as a fraction. 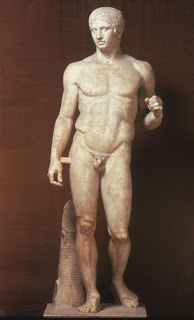 It is generally acknowledged that the work of Polycleitus in the fifth century BC was used by other sculptors as demonstrating the ‘ideal’ proportions of a man. The craniofacial height to standing height proportion of the available marble copies of the Doryphorus is 1/7.5. In the late fourth century BC, the prolific sculptor Lysippos is thought to have established a new canon using eight heads to standing height. This is evident from inspection of the Roman marble copy of the Apollo Belvedere in the Vatican Museum. 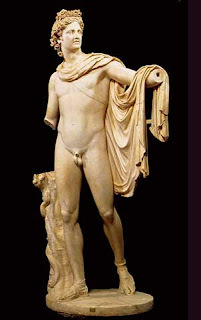 The Roman architect Vitruvius based his guidelines on the Classical Greek sculptors. He described the facial height to standing height proportion of 1/10, which corresponds to a craniofacial height to standing height proportion of 1/8. The scientifically enquiring minds of the Renaissance were no longer interested in blindly following the Classical ‘ideal’, and began to study human anatomy and record human proportions. Adapting the work of Vitruvius with his own research, Leonardo da Vinci provided the Renaissance canons of proportion. He described the ‘ideal’ craniofacial height to standing height proportion as 1/8. Durer later described the ‘ideal’ man of ‘Eight head-lengths’. The results of this study lend support to the use of a proportional ratio between the Classical ideal of 1/7.5 and the Renaissance ideal of 1/8. The craniofacial height to standing height proportion may be calculated from the original anthropometric data provided by Farkas2. From this original anthropometric data, the craniofacial height to standing height proportion in young adult males (age range 19–25 years) was found to be 1/7.7 (range 1/7.4 to 1/8.1), and in young adult females (age range 19–25 years) was found to be 1/7.6 (range 1/7.2 to 1/7.9) (Table 1). The results of this study, based on lay and clinician judgements of attractiveness, generally validate the anthropometric data. In this study it was found that a proportion of 1/7.5 was perceived as the most attractive, with 1/8 a close second. The images regarded as most attractive by the participants had a mean craniofacial height to standing height proportion of 1/7.8 (min=1/7 and max=1/8.5). The mean rank preference score was found to be minimal for a craniofacial height to standing height proportion of 1/8 and increased when the craniofacial height to standing height proportion moved away from 1/8 in either direction (Table 8). The influence of craniofacial to standing height proportion on perceived attractiveness. Naini FB, Cobourne MT, McDonald F, Donaldson AN. Department of Orthodontics, St George's Hospital, United Kingdom. 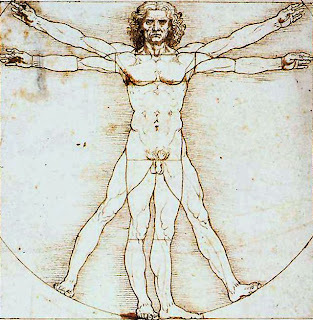 An idealised male image, based on Vitruvian Man, was created. The craniofacial height was altered from a proportion of 1/6 to 1/10 of standing height, creating 10 images shown in random order to 89 observers (74 lay people; 15 clinicians), who ranked the images from the most to the least attractive. The main outcome was the preference ranks of image attractiveness given by the observers. Linear regressions were used to assess what influences the choice for the most and the least attractive images, followed by a multivariate rank ordinal logistic regression to test the influence of age, gender, ethnicity and professional status of the observer. A craniofacial height to standing height proportion of 1/7.5 was perceived as the most attractive (36%), followed by a proportion of 1/8 (26%). The images chosen as most attractive by more than 10% of observers had a mean proportion of 1/7.8(min=1/7; max=1/8.5). The images perceived as most unattractive had a proportion of 1/6 and 1/10. The choice of images was not influenced by the age, gender, ethnicity or professional status of the observers. The ideal craniofacial height to standing height proportion is in the range 1/7 to 1/8.5. This finding should be considered when planning treatment to alter craniofacial or facial height. So I'm "ugly" (no, I'm not) just because I have an apportion of some 1/6.9? I'm not short, just high vaulted. Hmmm... what would an anthropometrist conclude from that? Isnt this something like that guy's "Beauty Mask" where everything must equal a certain number ? At least can you dunk? haha, not quite...almost. More like a "Super Layup"
from his work, "The History of Ancient Art" goes into great detail as to why I think. I wonder if they took into account the phase of the menstrual cycle that the female judges were in. It's hardly a secret that women prefer more rugged faces in their follicular phase. Perhaps facial robusticity would be reflected in one's CFH/SH ratio, at least on average. Craniofacial robusticity is more related to the lateral diameters of the face than to its height.